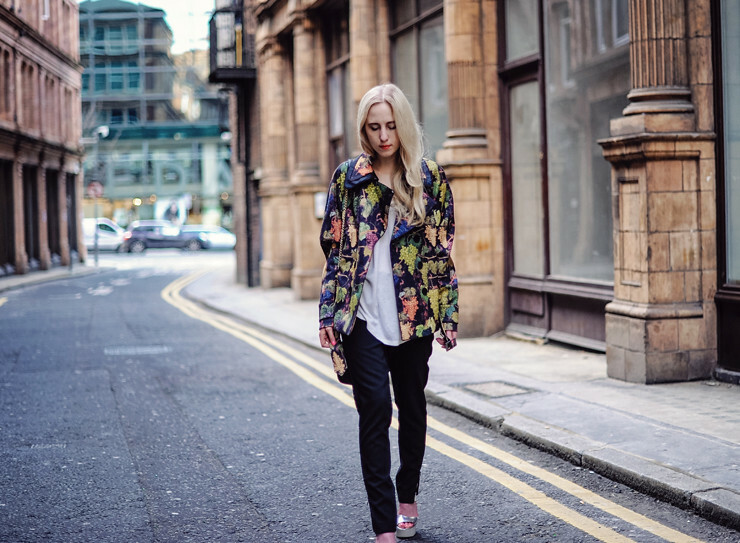 This is what I wore during third day of London Fashion Week. I managed to take quickly shots after Charlie’s May show, which was really great, simple clothes are something I love the most. Coming back to my outfit, I was wearing black straight trousers with shoe-showcasing zippers, a white t-shirt and Kenzo grape printed jacket. The weather in London is kinda a recompensation after freezing cold weather in NY during fashion week. I feel like it’s spring and really love it. God, this jacket is perfection! stunning jacket! love it so much! That jacket is indeed super-awesome! And it kind of surprises me that it’s warmer in London than NY… usually it seems to be the other way around! That jacket is such a statement piece, love it! such an unexpected, yet beautiful print!!! Płaszcz jest OSZAŁAMIAJĄCY po prostu jest przepiękny!! oh, już nie piszesz po polsku ? 🙂 wstyd? Great blog and you look amazing!! I love the coat, its very a very daring print, somewhat fashion forward. Loved the shoes, they are amazing. Wad a lovely jacket. So nice. Have a great time there! wspaniała jest ta kurtka, już mam ochotę na wiosnę! that’s just perfect! great pics, great outfit! thumbs up! Wow, that jacket is surprisingly wonderful! świetnie! bardzo lubie Twój blog:) jest pełen inspiracji! what a great jacket! followed on bloglovin’! Floral print or fruit print is my all time favorite,whether on Top, trousers or jacket.It just looks fab.And so I love this jacket also,specially it’s color. Those trousers with shoe-showcasing zippers look nice with these shoes. wowe what a beautiful jacket! I love the pattern of jacket ur wearing. Those shoes are too perfect! Very colorful!!! like the vibrant of the picture! I love your outfit! Your shoes is awesome! Love that this is shot on Grape Street! 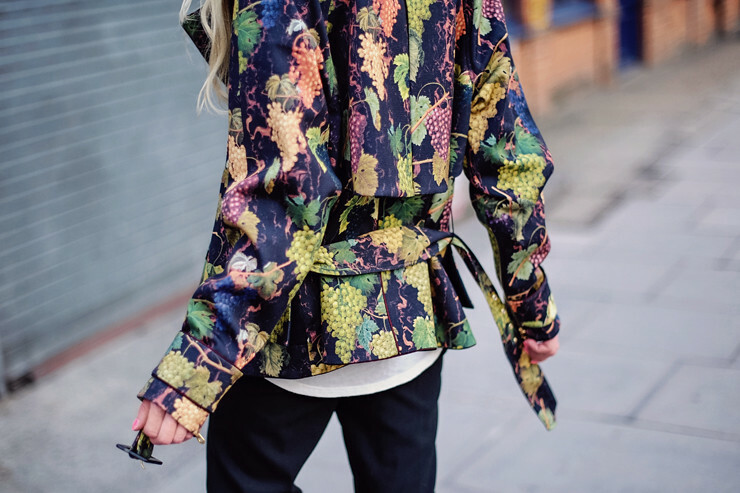 Absolutely love that grape prints, what a refreshing take on a kimono jacket! Love your style, Alice, and greetings from SF Bay Area!